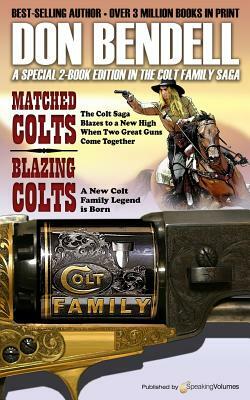 A special 2-book edition in the Colt Family saga.MATCHED COLTSThe Colt saga blazes to a new high when two great guns come togetherA NEW COLT TO RECKON WITH—A NEW LEGEND TO LEARNChris Colt, Chief of Scouts, didn't know he had a sister until he heard tales of the gunfighter blazing a vengeance trail westward on a manhunt for her husband's killers. Her first name was Charlotte, but Charley was the tag she went by when she strapped her holsters on her hips. Chris and his comrade, the Nez Perce warrior Man Killer, journeyed out to see for themselves what this firebrand of female fury was like, and whether she had the right to claim the Colt heritage and back up the Colt credo of frontier justice with her guts and her guns. What they found was a heart as brave, a draw as fast, and an aim as true as any man's...a woman whose courage and skill Chris Colt did not try to beat but just to match....BLAZING COLTSA new Colt family legend is born….WHAT IT MEANS TO BE A COLT…Chief-of-scouts Chris Colt and his half-brother, Joshua, are finally reunited with their sister, Charley, while avenging the death of her husband. But their newfound happiness is shattered when the trio returns to the Silver Cliff Ranch and find Chris's wife murdered and the children missing. It's a kidnapping gone wrong and now the young Colt children are running for their lives, alone in the mountains, with a brutal gang of cutthroats in hot pursuit. With one mad-as-hell Chris Colt trailing them, and his slippery son eluding them at every pass, the gang turns tail. But Colts don't stop until the job is done. Chris rides off, planning to hunt down the killers one by one, setting up the ultimate showdown between the orneriest and quickest gunslingers in the West—and the Colt family posse.